Herbacin Face & Hand Care Starter Set for natural cosmetics fans. Ideal for trying out or as give away. Herbacin Face & Hand Care Starter Set is just the thing for natural cosmetics fans who are curious and have high expectations. Ideal for trying out or as give away. Herbacin kamille Hand Cream Original (20 ml tin) – One of the world’s classics, the nourishing hand cream absorbs quickly without leaving a greasy film. Herbacin kamille Hand Cream Soft (20 ml Tube) – The light Soft Hand Cream is absorbed immediately. Protecting and moisturizing ingredients prevent skin from drying out. Herbacin ®med Moisturizing Cream (20 ml tube) – Its moisturizer’s special care formula with the healing powers of calendula calms even ultra-sensitive skin prone to inflammation in a particularly soothing way. Herbacin ®med Gentle Exfoliant (20 ml tube) – cleanses your skin gently yet deeply. Its nourishing formulation refines the skin and makes it fresh and radiant again. 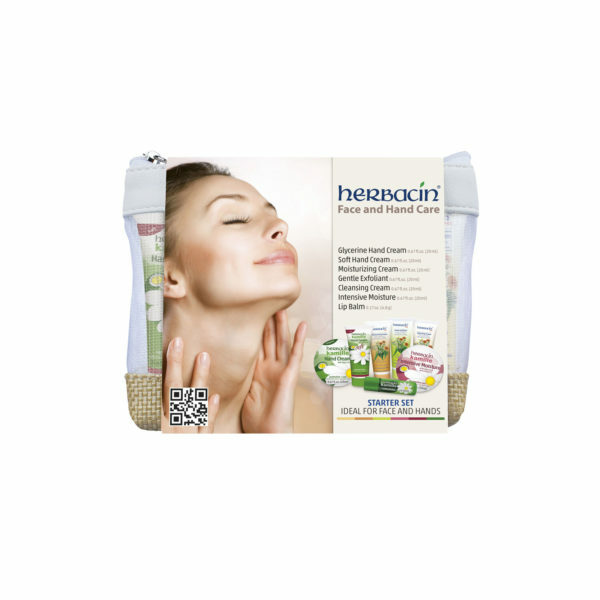 Herbacin ®med Cleansing Foam (20 ml tube) – is hundred percent soap-free, guarantees a refreshing cleansing experience, stabilizes the acid mantle of the skin and is also optimally suited for sensitive skin prone to inflammation. Herbacin Intensive Moisture (20ml tube) – for the needs of sensitive skin and as the perfect year-round protection without leaving an oily feeling. Intensely nourishing, it provides moisture for particularly stressed areas of the skin, such as rough hands, elbows or knees. Herbacin kamille Lip Balm (4,8 g stick) – puts an end to sore, chapped lips, offering gentle care and effective protection for our sensitive lip skin.